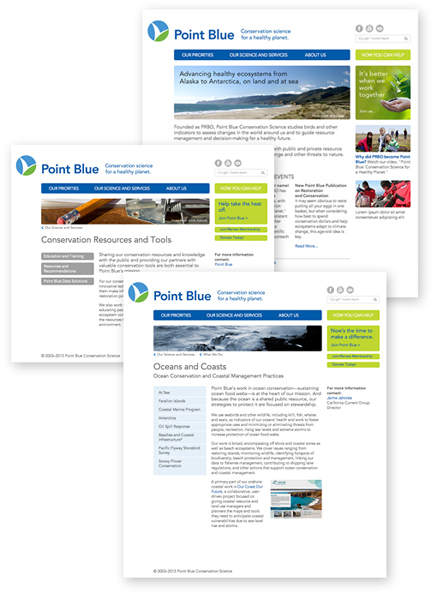 Point Blue Conservation Science, a non-profit conservation science organization focused on conserving wildlife and ecosystems through research, outreach and partnerships, launched a major rebranding program to highlight its broader focus on climate changes and its effect on the environment. Formerly known as PRBO a new name and brand identity was developed. Connector Branding developed an entirely new Point Blue website, www.pointblue.org, as the current site no longer accurately expressed its growing mission nor reflected its cutting-edge scientific research. The new site project included comprehensive strategy development, new user experience (navigation, design and copy), SEO, CMS development, build-out and launch.